» Forum » Market » Buying and selling advice » Whirlwind or Earthshaker? what's a fair price for these two machines? and which one would you take home? and is there anything I should check or look out for when shopping around for these? I personally would choose whirlwind and depending on condition they usually go from $2,300 to $3,000. I know I am in the minority here, but I love ES. Even more than WW. Avg. is like 2450. Price is the same on both. These for some strange reason have remained somewhat flat the last 5 years that I've been in the hobby. I'd put them at 2200-2400. The music/art of Earthshaker is a no-go for me... But that's doesn't say anything about the gameplay... So it's an easy decision. Completely subjective. In this situation, since sound is very important to me -- I'd play movies of both and NOT watch the game play -- until my ears told me which game sounds like more fun. I personally like both games. I like Whirlwind a little more. Whirlwinds tend to be a little higher priced. 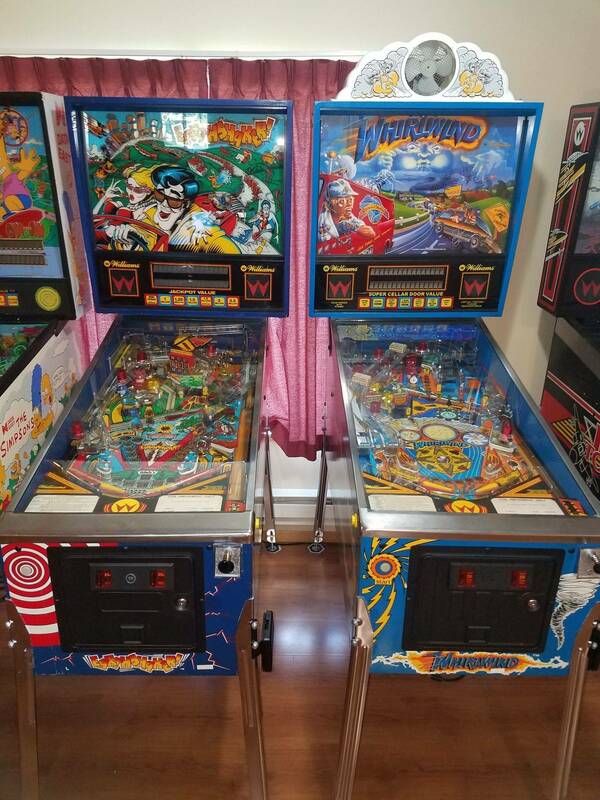 Condition is everything on these since they are system 11 games and both tend to have playfield wear issues. Some Whirlwinds will have a clear coated (Diamond Plate) factory playfield but most will not. ES tend to be in the $1800-$2500 range. WW $2000-3000. +/- depending on condition. It's kind of a crapshoot to me. They both have the same GENERAL rules (hit X lit targets to light locks and start multiball). WW has some more "stuff" going on...multiple scoops, ramp that opens, back drop target, spinning discs. I like them both a lot, but prefer ES by a nose, but that's all personal preference at that point. Price wise you're probably at 2,000 for ES and 2,300 for WW +/- based on condition/location. Whirwind and it is not close. Both fun playing games and close. But I would go Whirl Wind as the champ! Hard question, they are both really fun games. I paid 2300 for WW and my brother in law paid 2600 for his ES. Both natural disaster themes with different things going on. Pretty sure I like them the same. 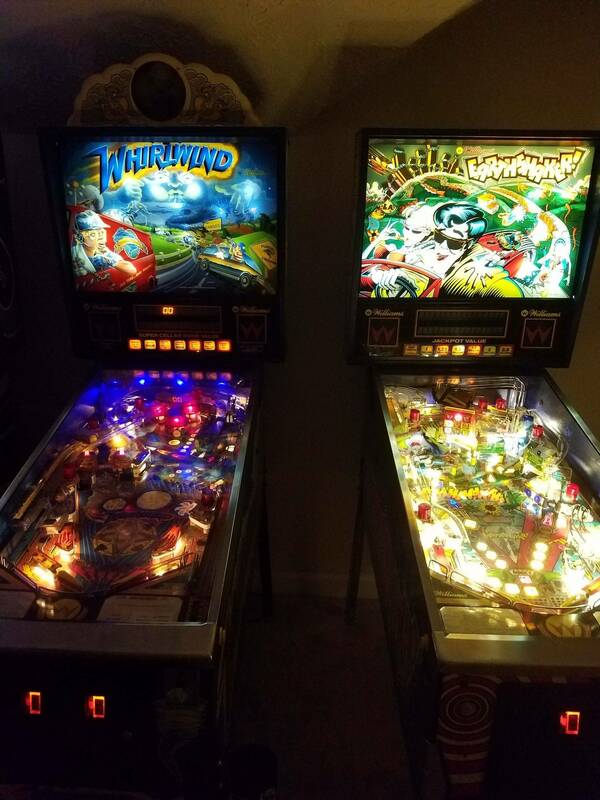 got both, whirlwind gets alot more play time. Whirlwind is by far the best System 11 so this is no contest. Whirlwind is tough to beat. Amazing game, and a personal favorite of mine. Earthshaker is a guest and family favorite though. Everyone gravitates towards it. They’re similar enough rules-wise, where owning both in a small collection might not be the best idea, but if you gotta have one or the other, Whirlwind’s the one to own. I have both and Whirlwind would get the nod from me. Similar rules but they expanded them a little on Whirlwind which makes it a better player. ES has really gotten too easy as well. Not to tough to max out the miles just about every game. If I had to give the edge to ES on anything it would be the art and music. I’ll be in the minority, but Earthshaker is the one on my “to buy” list. Nothing like setting off an earthquake. Totally subjective answer. So it isn't "no contest"
I prefer WW over ES as well. However, in my opinion, taxi is better than both. Again, subjective answer. I own both and whirlwind wins this one. Whirlwind is one of the greatest games ever created IMHO. I enjoy ES, but once you have collected the jackpot I don't think there is a way to relight it. That kills the game for me. Had both for a long time, and recently sold Earthshaker. I didn't want to sell anything, but ES was on the bottom. I prefer WW too. Much faster, more difficult game. Perhaps it's a regional thing but for me Earthshaker stands well above WW when you live atop the San Andreas fault. WW didn't last very long here even though it was diamond plate. Nah, Whirlwind is the best designed pinball machine up to that point in pinball history. It's certainly not my favorite. 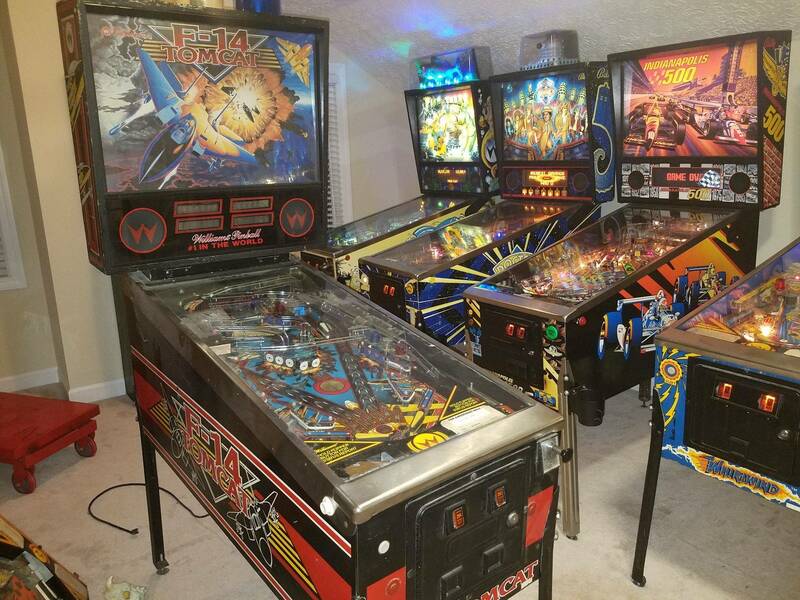 However, placing it against all other machines that were released prior to it, it's a much more involved and better designed game that paved the way for further elaborations in the industry of pinball. I will add that Earthshaker came with a feature that is added to almost every modern game whether it should have it or not. A well implemented shaker motor. The only time I see fans in games now is to cool things inside. Nostalgia aside, I prefer WW. Why did you sell WW the first time? I own both, but I'd personally have a hard time dropping top dollar on either at today's prices. There isn't but you can keep hitting the side ramp for (IIRC) 250k per shot in MB. I've owned both. Still own WW. I would give the nod to WW but I do love me some Earthshaker. Both are fun to me. WW, ES & F-14...nice...very nice! I own both. Similar rules, but as stated, WW's are more developed. On ES, I prefer the back glass ( by far), the call outs, the shaker and the sinking building. On WW, I prefer the advanced rules, the light show and the fan is cool. Pinside rates WW very high and I believe is the highest rated sys 11. So I would expect the answer here to be WW over ES. I am at a toss up. I would buy the one in the better condition, as stated earlier, finding this era game in great condition is difficult. As far as price, average condition , I would expect mid 2K region for both. For very good to excellent condition, expect to pay much more. My ES is a sample game in super shape. I turned down 5K ( I know I am a hoarder). ES is too easy, like most center ramp Williams titles. Agreed! The best way to summarize your dilemma is "win win" . You can't go wrong either way IMO. 1. As patrickvc says above, the mini-wizard mode in WW makes a big difference. Is it enough to sway your decision? Dunno...but it really adds to the replay-ability. When the timed cellar door light is lit, it gets your heart racing! 2. Personally, I find that the upper ramp shot is harder on WW than ES. On ES, the post feeds that upper flipper nice and slow, making the game more approachable. If you have young kids or lots of visitors, ES might be a better choice. Bottom line, grab whichever one you want. If you tire of it or want to switch it up, there will always be someone waiting to take it off your hands! I own a WW because I came across one in very good condition. I still want an ES! In my opinion, WW is the game that made Pat Lawlor a legend. His genius is on full display here and he has built on that greatness ever since. This was the game that said, there is a new big man in town. I don't like most Pat L games.. but I really like Whirlwind. I love my ES...and I didnt think I would until I worked it over to my taste and speed, a couple weeks ago! Love to challenge it with a WW, so keeping my eyes open! Whirlwind is the best pinball game ever made. I owned both, but give the edge to ES and yes, totally subjective. And like blackbeard, I feel Taxi is better than both. But then again, I think Grand Lizard is better than both. Exactly WW is a long time keeper for me. ES lasted a year. Went to get E.S last Saturday definately not a beautiful playfield like I was told , cab needed love he said ,yes it needs love. I passed on it only because I was hopeing playfield was better,..my kid was bummed out , after passing on a T.Z that monday i realized i was more bummed on not getting E.S decided the wear wasnt that bad ...the seller has decals for the cab, And I called back, am picking it up this Saturday after all... gonna surprise kid , had a taxi loved it, wish I never sold it but like the look of E.S the most and feel it's a all around tie with taxi, whirl wind more fun!! All 3 games r great!!! !